Wisdom Tooth removal is a type of minor surgical procedure which in most cases requires cutting of Soft tissue and also minor bone trimming. 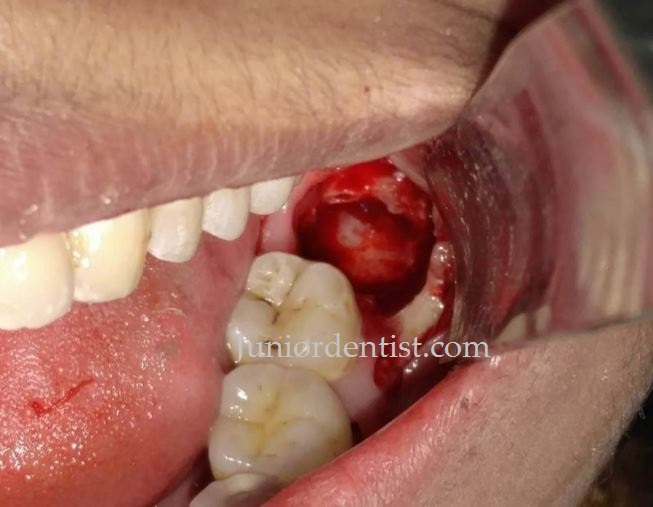 As a complication of bone cutting there will be swelling or odema in the extraction site following the Surgical Extraction of an Impacted Wisdom tooth or in general any impacted tooth. So let us look at the important points about Swelling after tooth removal. Post-extraction edema: Swelling is a normal postoperative response of the body to dental surgery. The amount of swelling depends on the procedure performed and the amount of bone trimmed down. There are two stages of Swelling or edema after Wisdom tooth removal or tooth extraction surgery. Initial stage of swelling: Initial stage of swelling starts between 24-48 hours of the surgery post-operatively. Applying Ice pack or Cold on the external surface of the jaw after extraction. Heat should be not be applied at any cost in the extraction site. Second stage of swelling: This phase starts between 48 to 72 hours postoperatively where the swelling reaches its maximum. In this stage applying moist heat helps in reducing the swelling. When does Swelling start after Wisdom Tooth removal / Extraction? The swelling is seen around the jaw buccal to the extraction site, cheeks, below the jaw (lower tooth removal), below the eyes (upper tooth removal) and side of the face. Note: In case swelling doesn’t start to subside visit your Dentist as it might be due to post operative infection. Follow the instructions given by your Dentist to minimize the extent of swelling after wisdom tooth removal, there will be swelling so be ready to deal with it. You can follow the below steps to make sure that the swelling is minimal. Surgical Extraction of a tooth is a minor surgery so do not take it lightly and make sure that you follow all the steps mentioned by your dentist like medications and revisits. Why does Swelling occur after Tooth Extraction Surgery? Swelling or edema is a normal response of the body on experiencing trauma. The body’s response to trauma is inflammation reaction. As a reaction to Trauma, fluids in the body mainly containing White blood cells are sent to the trauma site which help in the healing process. The swelling or edema also helps in increasing the blood circulation to the traumatic area which is the main source of supplying nutrients and other healing materials to the bone and soft tissue repair. hence due to all these changes, we can see swelling in the tissues surrounding the extraction site. What types of Tooth Extractions lead to Swelling? You can check out the other posts regarding Wisdom tooth removal or surgery – when should you get the wisdom tooth removed. Dental public health is concerned with the prevention and control of disease through community efforts. Endodontics deals with the diagnosis, prevention and treatment of conditions of the dental pulp and nearby tissues. The research, identification and diagnosis of illnesses of the teeth, mouth and nearby regions is covered in the specialization of Oral and Maxillofacial Pathology.